Your smart thermostat can use your phone’s location to figure out if you’re home or not. Imagine an invisible border surrounding your home. When you’re “inside” the border you’re considered to be “home”, so your thermostat makes things nice and comfy for you. When you’re outside that boundary, your thermostat lets the home’s temperature rise (or fall) a bit to save you some money so you don’t cool or heat an empty place. Geofencing is ideal for people who are in and out all day, or don’t follow a set schedule day-to-day. 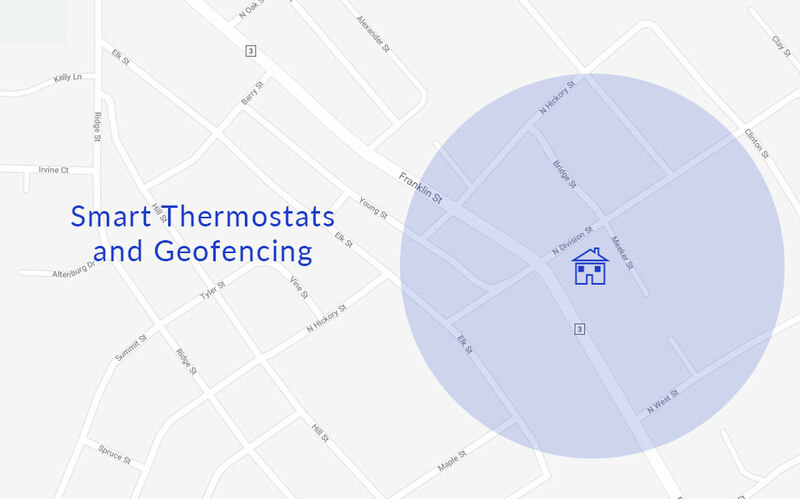 For those people, geofencing can be a useful feature that takes some of the effort out of adjusting the thermostat. Let it figure out when you’ve left and when you’ve returned, and take all the effort out of trying to develop a schedule that suits your unpredictable days. Even better, geofencing isn’t limited to just thermostats: many sophisticated smart home hubs exist to control all of your home’s smart devices based on whether you’re home or not. If anyone in your family doesn’t have an iOS or Android phone, or doesn’t have cell service on their device, geofencing may not work for them. We think Nest has the best implementations of geofencing on the market right now, namely because it supports multiple accounts (one per member of your household) and can track all of them simultaneously. When the last person leaves, it goes into “away” mode. When the first person comes back, it goes back into “home” mode. When you set up your Nest account, you can enable the Home/Away Assist feature and assign it a device to watch. You can only assign one device per account (but you can associate multiple accounts with your home). Nest uses a combination of cell and WiFi data from your device to figure out if you’re home and raises/lowers the temperature accordingly. “Away” mode can kick off away settings for all your Nest devices – Nest Protect, Nest Camera, etc. We’ve loved ecobee for years, but its geofencing left something to be desired. The impression we got from playing around with ecobee’s geofencing feature is it’s kind of a mess right now. To use Ecobee geofencing with an Android phone, you can configure it through the ecobee app itself. This works great for my partner, but not for me – I’m on iOS. To use it with an Apple (iOS) phone, you have to configure it through Apple’s own HomeKit app, which requires a hub (such as an Apple TV, a HomePod, or an iPad that stays home all day). While I have an Apple phone, I don’t have any of the other devices, so I wasn’t able to get into the ecobee geofencing party myself. Assuming you do get the geofencing set up, you might be surprised to find that it doesn’t really coordinate with the temperature/motion sensors that helped make ecobee so popular in the first place. If you and your phone are set up with ecobee’s geofencing, and you leave (taking your phone with you) and go out for the day, but someone else stays home, their motion won’t be enough to keep the ecobee in “home” mode – the geofencing setting will prevail and they’ll be left cold (or sweating). Furthermore, the ecobee geofence triggers seem to act like “holds” rather than a return to schedule. Paul Quinn over at androidpolice.com reports this issue in greater detail. Later, we found that if we set up the geofence trigger to “Resume my schedule” upon returning home, it would go back to that schedule – even if the scheduled thing was a temperature setting you’d normally want to use when you’re not home – which could be interrupted by walking by a sensor to tell the ecobee you’re actually home so it adjusts to a temperature you’d normally want when home. 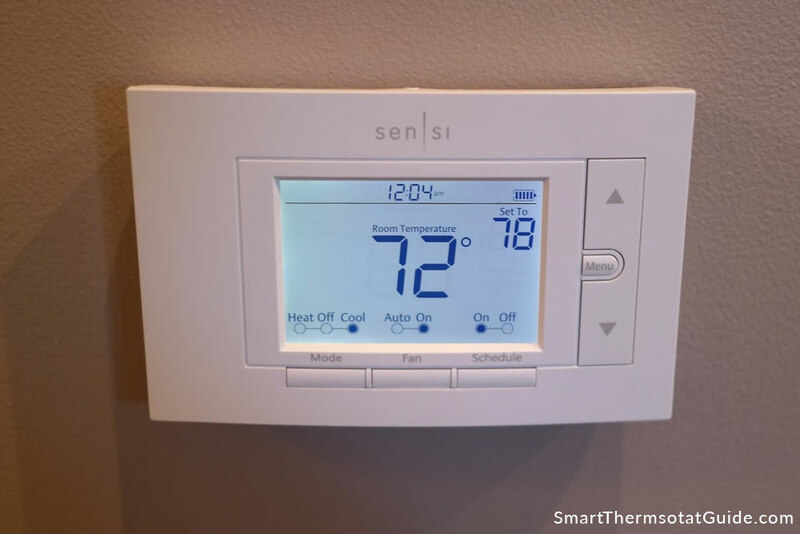 At this point, we threw our hands up – this is just way too much overhead for a thermostat, something that should be effortless and almost completely out of mind. We love ecobee, but we ran into a lot of frustrations trying to use this specific feature. And, apparently, so did a lot of other people – so many, in fact, that ecobee themselves suggests ecobee users rely on IFTTT and Life360 to manage geofencing and their products. 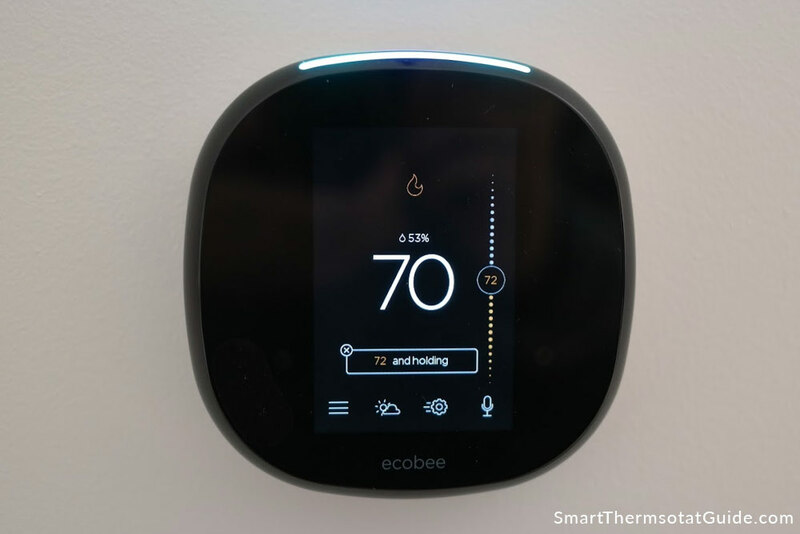 The Smart Cave has a detailed guide for getting started with IFTTT and Life360 with an ecobee thermostat. The Sensi hardware itself may look simple, but the app offers surprising capabilities. Sensi’s geofencing feature is quite basic – you’re either in the 3-mile radius or you’re not, and every member of your household has to share the same login credentials in the app in order to take part in the geofencing. There is currently no way to adjust the 3-mile radius. Basic’s not so bad, though – after all the craziness we went through trying to get geofencing working with an ecobee thermostat, we have a renewed appreciation for basic. Rather than configuring individual devices to manage automation, you can link all your smart home devices to a hub and control things through that. The extra setup steps are worth it – most people seem to be happy with the end result. We discovered the IFTTT/Life360 combo when trying to get geofencing working with our ecobee. Both are free, and the setup is pretty straightforward. Life360 follows all of your family’s phones (up to at least a couple dozen) and you can customize multiple fences, ie: around your home(s), work, school, etc. Make the fences as big or as small as you want, and set up triggers that work for all of your smart home devices, such as light bulbs, cameras, and thermostats. When last person leaves the home fence, set thermostat to “Away”. Here’s a page of steps to help with connecting IFTTT to Ecobee, since ecobee’s built-in geofencing leaves something to be desired, but IFTTT is compatible with nearly every smart thermostat on the market right now. If you get set up with IFTTT and Life360, you can use it to control nearly any WiFi enabled thermostat on the market right now. We think this is the way to go – it’s free, easy to set up, and compatible with virtually everything. Samsung’s SmartThings Hub (which we have not personally used) is an oft-recommended smart home management device. 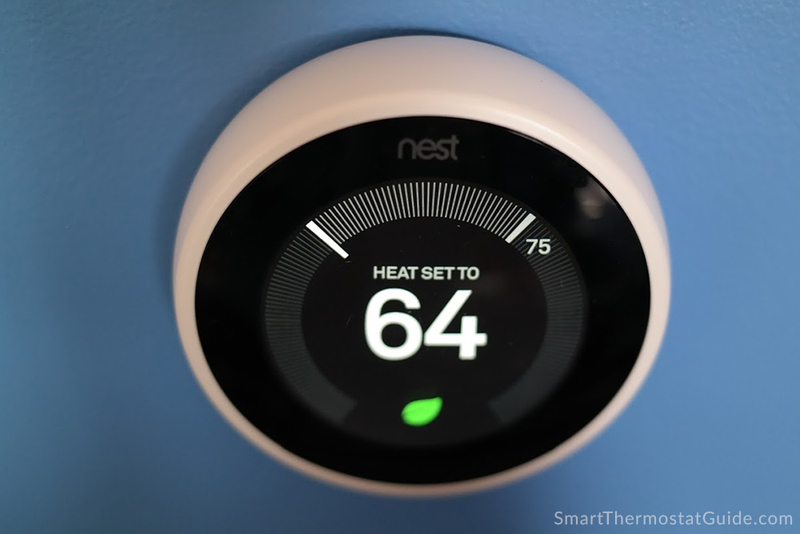 It supports geofencing natively, and may do a better job of handling geofencing for a thermostat than the manufacturer’s own app. Also, SmartThings lets you control virtually any WiFi-enabled smart device, such as smart lightbulbs, home cameras, smart outlets, and more.